Hello! Today I want to share my very first watercolour card! I started with a base of the Crafter's Companion Watercolour Card, which I wet a little (but not too much) then added some rich Purple, Navy and Turquoise watercolours to my Tim Holtz Stamping Platform. (These are available for Pre-Order and I recommend them wholeheartedly. Positioning is so simple!) Once I had added the watercolour, I smooshed (my technical term!) it around a little to mix the colours, then "stamped" it onto the wet Watercolour Card. You can try this technique with inks and a little water as well! Once this colour had dried, I used some White watercolour to add 'Falling Snow'. Once the watercolour had dried, I added some detail with my favourite Gummiapan Stamps and some Tsukineko Inks. To create the woodland effect, I started with the smallest tree in the set and the London Fog Tsukineko Ink, then stamped more than once to make the most of the ink and the faded look added to the misty effect! 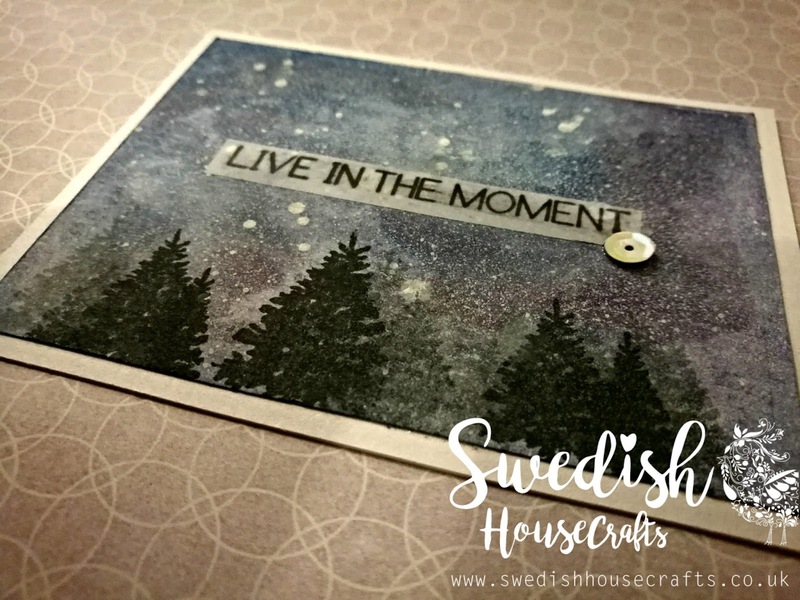 I used the medium tree in the set with a mixture of London Fog Tsukineko Ink and Tuxedo Black Tsukineko Ink. Finally, I added a mixture of trees, using only the Tuxedo Black Tsukineko Ink. 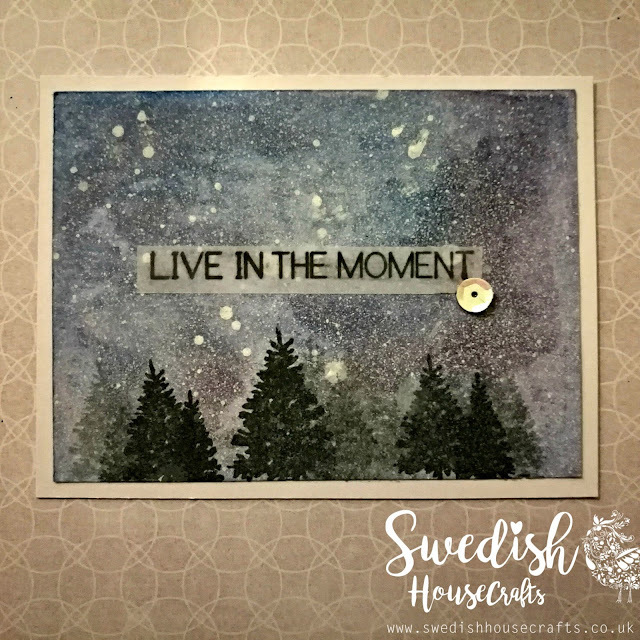 Nature to me, reminds me to breathe and relax, so I decided to add a small sentiment with the Gummiapan Live In The Moment, Love Life Stamp to a little bit of my favourite Crafter's Companion Printable Vellum. 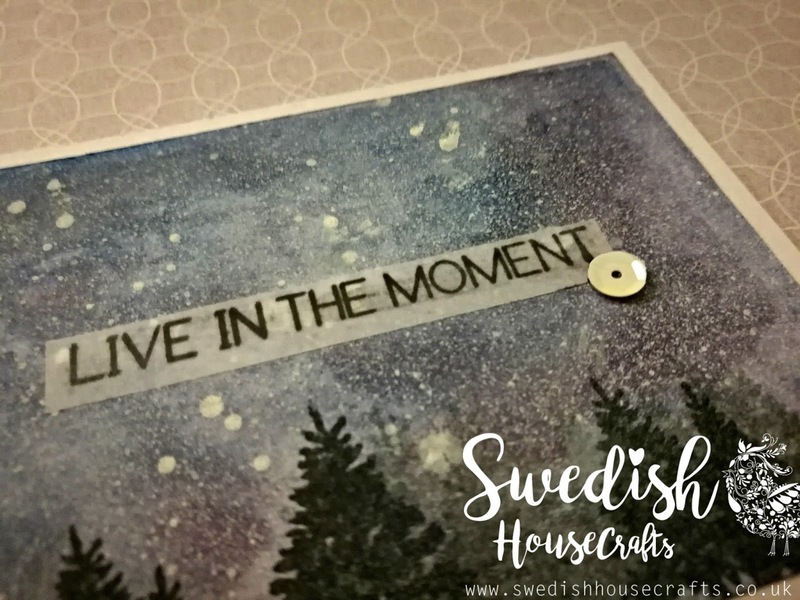 I used only a small section of the stamp to add my sentiment (I love how versatile stamps can be) as a reminder to myself! I used a teeny, tiny little bit of the Crafter's Companion Extra Strong Permanant Glue Tape to add my vellum sentiment to the watercolour card. It's my favourite Glue Tape because it really sticks and it's completely invisible under vellum! One last little sequin and my first watercolour card was finished! 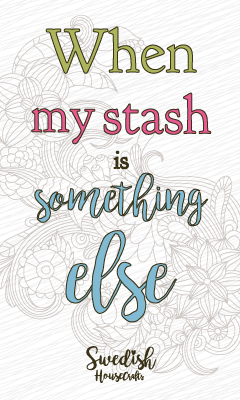 I think this would be wonderful as a Christmas Card, combined with a nice Christmas Sentiment Stamp, don't you?